Our orthopaedic surgeons are acknowledged leaders in all areas of orthopedic care, including advanced reconstructive procedures and total joint replacement of the hip, knee, and shoulder. If you suffer from debilitating osteoarthritis that is interfering with your quality of life, joint replacement can relieve your pain, restore function, and get you back to doing the things you love. If you need joint replacement surgery, you can trust our board-certified orthopedic surgeons to help minimize your pain and restore your function. With advanced skills and training, they can replace or reconstruct all or part of a joint, depending on the severity of your condition. 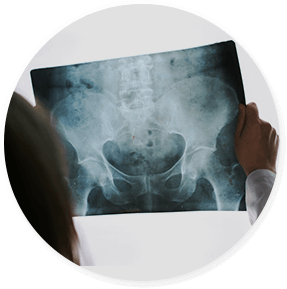 After a thorough physical examination and imaging studies, our doctors will determine which joint replacement procedure is right for you. Our orthopedic surgeons may recommend a reverse shoulder replacement if you have a completely torn rotator cuff that cannot be repaired or severe arthritis with rotator cuff damage. During this procedure, the surgeon reverses the position of the ball and socket in order to achieve greater functionality. A reverse shoulder replacement relies on the deltoid muscle, rather than the damaged rotator cuff, to stabilize and raise the arm. If you are experiencing limited mobility from severe osteoarthritis, it may be time for joint replacement. For a comprehensive evaluation by one of our orthopedic surgeons in Pembroke Pines or Lauderdale Lakes, Florida, call (954) 735-3535 or you can request an appointment online.